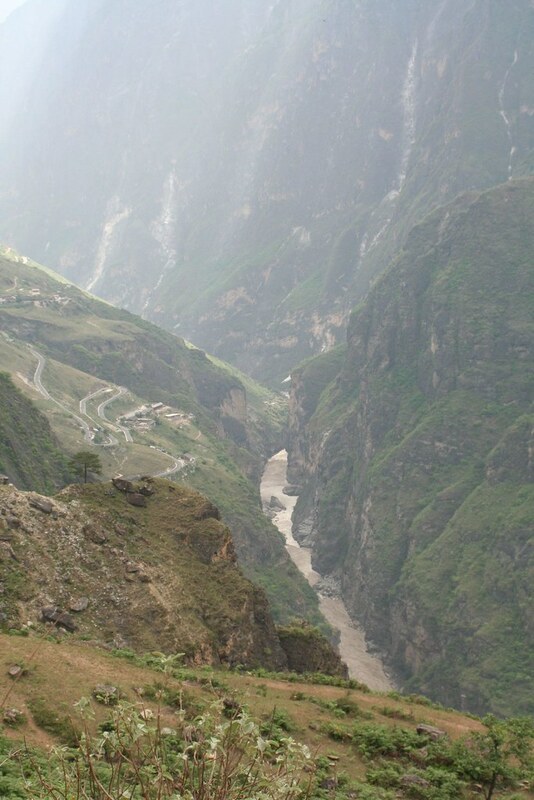 We just did a mini-trek at Tiger Leaping Gorge, it’s in the western part of Yunnan and it’s famous for being one of the steepest and most dramatic Gorges in the world. I have to say, it’s probably the highlight of China for us right now. No maddening crowds of Chinese tourists, great scenery and wonderful weather helped out plenty. We did the hike in two days but it could be done at a more relaxed pace in three or four days. We received a second-hand copy of a hand drawn map from a British fellow in Lijiang the day before we set out. Every guesthouse on or near the trail distributes their own version of this map. On it you’ll find helpful information like distances, hiking times, vague notions of where the trail goes, and the location of their guesthouse in large black magic-marker letters. All of them conflict with one another, and none are to scale. Still, they’re somewhat helpful. We hopped a bus to the trailhead in Qiaotou early the next morning. Our plan was to hike about two-thirds of the trail that day, finish early on the second day and get back to Lijiang by nightfall (I needed to apply for a Visa extension the following day). Most people choose to just take supplies to last them a few nights on the trail, and for those interested, there are a number of cafe’s in Qiaotou that will hold your bags for you if you don’t plan to go back to Lijiang. There are a number of trails. The old “low trail” has now been made into a two lane road by the government (more about that later). So we took the “High Trail”, the first 10 km of which are famously tough. It’s all up until you reach the “28 Turns”, from there it is straight up. The 28 Turns put a hurt on us and we quickly decided that I could still get my Visa extension if we took the first bus back to Lijiang on Friday instead of the last bus on Thursday. So in the end we hiked a little less than half-way the first day choosing to stay at the “Tea Horse Guesthouse” our first night. The second day went much better for the most part. It’s mostly flat, with a few climbs and a few steep descents. One thing they don’t put on the maps are the four waterfalls you have to walk through – I said through – not around or over, through. Each gave us a little pause. We made pretty good time to where the “High Trail” and “Low Trail” meet. From there we could have arranged for a cab to come pick us up, but we chose to hike down to the river and take a ferry across the Yangtze, spend the night in the small town of Daju and hop on a bus the next morning. Big mistake! The climb down to the ferry was tougher than anything we had done yet at the gorge, the climb up the other side comical. Here’s the thing: there are three Ferries. One, the “Old Ferry” no longer runs. There’s the “Winter Ferry” about 45 minutes down the “Low Trail” that we took. And the “New Ferry” about 10km on from there. No one told us about the Winter ferry. The English fellow we ran into gave us some vague idea of landmarks to look for to find the ferry, but he took the New Ferry. The very same landmarks lead us down the much steeper, scarier, and potentially deadly path to the Winter Ferry. That path was basically straight down the steepest part of the gorge, over loose rock and shear cliff-face, hurray! Luckily, the ferrymen on the other side saw us climbing down and came down to pick us up, we were their only fare that day. No one takes that path because it’s too crazy. After taking us across, the kindly ferry operators offered to drive us to Daju for a modest fare. Then, after taking a look to see if there was anyone behind us, closed up shop (for the day) and drove us into town. Lord help any unlucky souls that went down that path after us expecting a ferry, because it wasn’t going to come until the next day. As for the TLG, see it soon if you want to see it at all. The PRC government is planning a Three Gorges style Hydro-Electric Dam for that area. Remember that road, that use to be the “Low Trail” I mentioned before? It’s the road that all the Dam construction traffic will use.